You are browsing the Blog for Books Archives - Every Tongue. My leisure reading at the moment is Lesslie Newbigin’s thought-provoking Foolishness to the Greeks: The Gospel and Western Culture. Newbigin looks at the distinctives of Western culture, particularly the dichotomy between private and public spheres, with science and “facts” ruling the supposedly objective public space and religion confined to the subjective private realm of life. He then examines many of the assumed foundations of Western culture, questioning whether they stand up to their own claims and logic, and asks the question of how a community convinced of the truth of the gospel can and should interact with this culture. Traditional Christian ethics had attacked covetousness as a deadly sin, and Paul had equated it with idolatry: the putting of something that is not God in the place belonging to God (Col. 3:5). The eighteenth century, by a remarkable inversion, found in covetousness not only a law of nature but the engine of progress by which the purpose of nature and nature’s God was to be carried out. The enormous consequences that have followed from this reversal of traditional values are familiar to us. It has shattered the age-long assumption that the world we inhabit is basically stable and finite and that consequently economics is mainly about the sharing of limited resources. It has shifted the focus of attention from distribution to production. It has made us familiar with the idea of ceaseless and limitless growth, of unending possibilities of increased mastery over nature that provides increased resources of food, materials, and energy. This is a world in which economics is mainly about increasing production, and it is assumed that if everyone pursues his rational self-interest, production will grow and distribution will take care of itself. Two hundred years after the Enlightenment, we live in a world in which millions of people enjoy a standard of material wealth that few kings and queens would have matches then, but in which the gulf between the rich minority and the abjectly poor majority is vast and growing, a world therefore threatened as never before by destructive violence. Newbigin, Foolishness to the Greeks, pp109-110. It seems curious to me that in church we talk about giving, sacrifice and denying oneself, but in our view of economics we can believe that if everyone looks after themselves then all will be happy. It seems to me that this view of economics is no more than a kind of social Darwinism, a survival of the wealthiest, whereby the greater good of society depends on the unimpeded right of all to pursue unlimited personal wealth and happiness at any cost. This is not only completely foreign to the themes of the Bible and the revelation of God’s character contained therein, but in a world of finite resources is bound to lead to exploitation of both the environment and of the majority of people who are unable to achieve this goal. Before anyone accuses him (or me) of being a Communist, I should point out that Newbigin is equally clear that extreme socialism, which values equality over freedom (in contrast to capitalism which extols freedom over equality), is not the answer either, and proposes that we should rather adopt a relational view of society, politics and economics. Easter is bigger than us! If what I have suggested is anywhere near the mark, then to insist on heaven and hell as the ultimate question – to insist, in other words, that what happens eventually to individual humans is the most important thing in the world – may be to make a mistake similar to the one made by the Jewish people in the first century, the mistake that both Jesus and Paul addressed. Israel believed (so Paul tells us, and he should know) that the purposes of the creator God all came down to this question: how is God going to rescue Israel? What the gospel of Jesus revealed, however, was that the purposes of God were reaching out to a different question: how is God going to rescue the world through Israel and thereby rescue Israel itself as part of the process but not as the point of it all? Maybe what we are faced with in our own day is a similar challenge: to focus not on the question of which human beings God is going to take to heaven and how he is going to do it but on the question of how he is going to redeem and renew his creation through human beings and how he is going to rescue those humans themselves as part of the process but not as the point of it all. If we could reread Romans and Revelation – and the rest of the New Testament, of course – in the light of this reframing of the question, I think we would find much food for though. In the library today I picked up Chris Wright’s latest book, The Mission of God’s People. So far I’ve only read the introduction, but I’m excited by how Wright seeks to bring together theology and mission, helping us to realise that God’s mission, the Bible and the church cannot be separated, but all rely on each other. I am the son of missionary parents and I studied theology at Cambridge. But the two seemed to have little connection in my youthful zeal as a Christian. They certainly had no connection in my Cambridge theology studies, where (as far as I remember) “missiology” was not even a word at the time. Most of my Christian friends who were interested in supporting and praying for missionary work were not interested in theology, beyond weekly Bible studies. And the theology department certainly wasn’t interested in mission. Theology, it seems, is all about God. It rummages around in what (mostly dead) people have thought and written about God, God’s character and actions, God’s relationship to the world, to human society, God’s involvement in the past, present and future, and the like. Mission, in happy contrast, is all about us the living, and what we (or some of us at least) believe we are supposed to be doing in the world to help God along a bit. Mission seems to be about helping God to get over those barriers of strange cultures and faraway places that he seems to have such difficulty crossing. So, in mutual suspicion, theologians may not relish their theories being muddied by facts on the ground and the challenging questions thrown up by the messiness of practical mission. Practitioners of mission, in quick riposte, may not wish to see their urgent commitment to getting on with the job Christ entrusted to us delayed by indulgent navel-gazing about obscure long words ending in -ology. There should be no theology that does not relate to the mission of the church – either by being generated out of the church’s mission or by inspiring and shaping it. And there should be no mission of the church carried on without deep theological roots in the soil of the Bible. No theology without missional impact; no mission without theological foundations. Apparently The Mission of God’s People is more than just a shorter and easier version of the excellent The Mission of God: Unlocking the Bible’s Grand Narrative (which I’ve blogged about a couple of times). Whereas Wright’s former book looked at the theme of mission running throughout the Bible, asking what it means to read the whole Bible from a missional perspective, this book assumes that mission is a major theme of the Bible and asks “so what?” What does it then mean for God’s people today to live in light of his missional nature, and his ongoing work of reaching out to all nations? In Reading the Bible: Where’s Waldo? and the Council at Jerusalem I shared how I have come to realise that much of my Bible reading has been self-centred, looking for how the text applies to my life without first understanding the text on its own terms. I wanted to give some examples of errors I think we can easily make in Bible reading, and then to mention three books that have helped me to better understand and be inspired afresh in my reading of the Bible lately. Firstly, in our eagerness to take the Bible seriously I think we can often look in great detail at very small sections of Scripture, dissecting them for small gems that are relevant to us. This isn’t necessarily a bad thing in itself, but the problem comes when this is all that we do, never taking a step back to see the bigger picture. The danger when only studying a few verses is that we take them out of their context, add a few of our own ideas, read a few other out-of-context verses that back up our argument, and hey presto, we’ve made the verses say what we wanted them to all along! I would love to see a church pastor preach a series that looked at a whole Bible book each week. For sure there would be huge amounts of detail that were left out, but I think there would be great value in helping the church to understand how the various parts of the Bible fit together, what the distinctives of the different books are, and the different issues and challenges they are addressing. Recently I’ve loved reading The Drama of Scripture: Finding our Place in the Biblical Story by Bartholomew and Goheen. The book basically tells the story of the Bible, as a narrative, in 200 pages. It is obviously a broad sweep, and is the authors’ interpretation of the narrative of Scripture – anything less than a full duplication of the Bible has to involve some level of interpretation. But it is brilliant at bringing together parts of the Bible that we may never have connected, and I love the fact that it treats the Bible as a narrative rather than a theology textbook. I would strongly recommend the book to anyone who has ever tried to read the whole Bible but failed, or even to those who have read the whole Bible but have struggled to piece together the diverse parts. Related to this, the second failing I think we often make is to read the Bible as a one-dimensional answers-book to all our problems, rather than a diverse collection of documents inspired by God. I have recently finished the excellent How to read the Bible for all it’s worth by Fee and Stuart, which is a book I wish I had read 15 years ago. It is easy to read, asking what it means to read the Bible on its own terms, and then how we should interpret the Bible today. The authors show that taking the Bible seriously doesn’t (and shouldn’t) mean taking everything completely literally for ourselves – even amongst those who claim to take the Bible absolutely literally as God’s word for them, few have made the trip to Troas to pick up Paul’s coat and books, as Paul asks in 2 Timothy 4:13. Fee and Stuart uncover some of the ways that we often sub-consciously interpret the Bible for ourselves, and ask how we might do so in a way that is consistent with the message and purpose of Scripture. On one level their thoughts are remarkably simple, but many of the points they make are things that I have never heard discussed in the western evangelical church before. The third error that I think we often make in reading the Bible is not to understand the mindset of the original hearers. I think it is natural for us as humans to assume that everyone is like us and sees the world in the same way, and it often comes as a shock to us that this isn’t the case. Similarly when we read the Bible I think we often assume that the community to whom it was first written thought like 21st Century Europeans or North Americans. But to really understand the Bible I think we need to ask what it meant to the first hearers. What was meant by a covenant in the Ancient Near East 3,000 years ago? How did it feel to be under threat from powerful empires with their own gods and kings? What expectations were there of God’s messiah? How did Jews in 1st Century Palestine relate to the Romans and other gentiles? What did justice mean in this context? How did different people try to make sense of the apparent failure of the covenant and the destruction of the temple? What were their hopes and expectations for the future? For me the work of N.T. Wright in this regard has been hugely helpful. I’m sure there are many excellent Bible scholars who can help to answer these questions and explore the worldviews of those the Bible is written to, but I have just started Wright’s Christian Origins and the Question of God series. It is certainly heavy going, and probably not for everyone (probably not for me in fairness, but I’m slowly wading through…) but I love the way that Wright takes seriously the way that 1st Century Jews saw the world, and hence how we should understand their interactions with, and writings about, Jesus. I for one am grateful that God speaks to us through the Bible, and that he does so even despite our imperfect reading and interpretation of it! But I pray that God would take me beyond myself as I read the Bible, and that as I see more of him in Scripture that I would think of myself less and know and love him more. 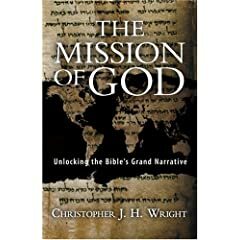 After meaning to for several months, I’ve finally started my way through Chris Wright’s mammoth book, The Mission of God: Unlocking the Bible’s Grand Narrative. As it’s 500 or so pages long there’s no way I’m going to remember all the good quotes when I get to the end, so I thought I might post a few as I go along, if nothing else to provide myself with a summary of what stood out to me in the book. The first section is about the Bible and Mission. Wright says that he used to teach a course on the biblical basis of mission, but became increasingly convinced that the western evangelical method of listing out a few proof texts to prove what we’d already decided was true, just didn’t do justice to the missional nature of the whole Bible, including the Old Testament. But before we can gain a fuller understanding of such a foundational theme we need to become aware of the cultural glasses* through which we view the Bible, and the world in general, and take a step back to see the bigger meta-narrative that runs through scripture. Wright suggests that reading the Bible together with people from all nations can give us a much broader and richer view of God, and shed light on the missional theme running through every page of scripture. What we [the church] have to offer, I contend, is a missional hermeneutic of the Bible. The Bible got there before postmodernity was dreamed of – the Bible which glories in diversity and celebrates multiple human cultures, the Bible which builds its most elevated theological claims on utterly particular and sometimes very local events, the Bible which seems everything in relational, not abstract, terms, and the Bible which does the bulk of its work through the medium of stories. If I can get my mind around it I’ll try to continue to post some thoughts from the rest of the book as Wright explores how God’s mission to his world is an/the overarching theme of the entire scripture narrative. It might take a few months however…! *Someone once told me he was going to Kenya for a couple of weeks to give some Bible teaching to Pastors because “they always read the Bible through their own cultural glasses”. While agreeing with his statement, I don’t think he had appreciated the irony that he also had his own cultural glasses through which he read the Bible… it’s just that our glasses are a lot more obvious to those around us than they are to ourselves.